The Nokia Lumia 1020 smartphone camera is almost certainly the best smartphone camera on the market currently. It produces high quality images that will easily surpass the output of nearly all smartphone cameras ... and even some fixed lens digital cameras. If you're an advanced photographer, the Lumia 1020 probably won't produce images quite good enough to replace your advanced fixed lens camera, and it certainly can't replace your interchangeable lens camera. But if you own a beginner-level point-n-shoot model, the Lumia 1020's high resolution images will impress you. The Nokia Lumia 1020's is a bit of a slow performer, runs Windows Phone 8 OS, and lacks a full HD touchscreen display, but the strong camera image quality makes up for these drawbacks. Read more in our Full Conclusion. You've probably seen the commercials for the Nokia Lumia 1020 on TV. It's the Windows smartphone with like a trillion 41-megapixels that gives parents the ability to sit at the back of an school auditorium where instead of getting close to take pictures (and fight all the other smartphone-equipped parents), you simply take a photo from far away and then later crop down to the picture you need. You know, because 41 MEGAPIXELS!!!! While we first were a bit skeptical about the 1020's camera when it was relsased, we commended Nokia for trying to do something different. Assuming this image sensor isn't a mega(pixel) disaster, it has some impressive specs. Notably, a sensor size of 1/1.5-inch (larger than any other smartphone, and most digicams as well), a 3x Digital Zoom feature, a 26mm lens with a f/2.2 aperture, Optical Image Stabilization, a bright Xenon flash, a 15cm minimum focus range, and Full 1080p HD video recording at 30fps. Plus, there's five full photograph apps with which to play, including panorama. The smartphone runs off a 1.5GHz dual-core processor with 2GB RAM. Internal storage is a decent 32GB, but the Lumia 1020 includes 7GB of free cloud storage. No optional microSD card slot is available. This smartphone also includes the full suite of Microsoft Office apps, Xbox Live Hub capabilities, multiple email service compatibility, and Wi-Fi / NFC / Bluetooth 4.0 for connecting the 1020 to the web and/or other electronic accessories. 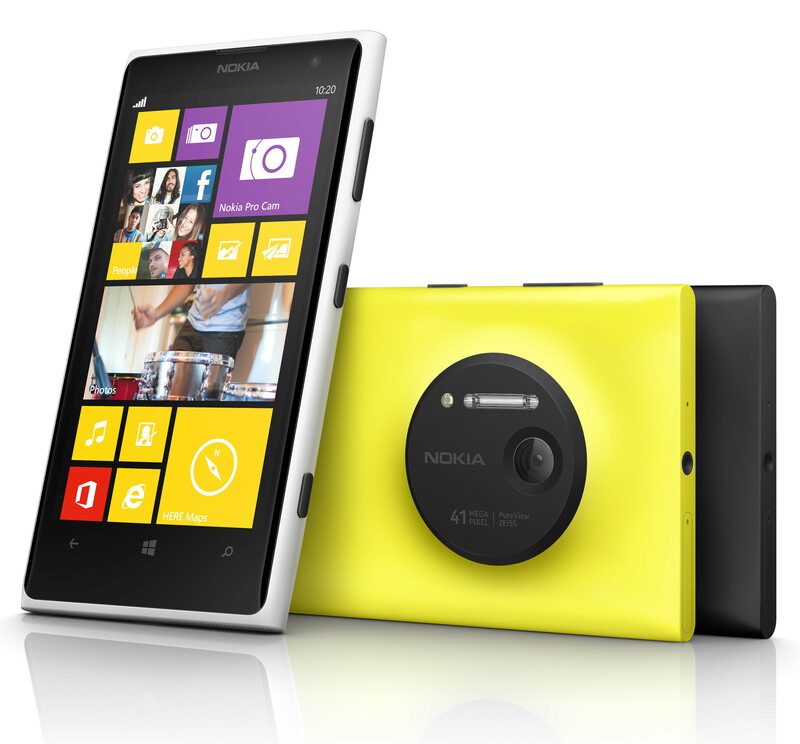 The Nokia Lumia 1020 -- available in black, white, or yellow -- works on the AT&T cellular network. If you sign up for a two year contract, you can buy one for as little as $49.99. Unlocked versions cost $610. Buy one today directly from the Microsoft Store, Amazon, or AT&T.